Top Snooker Stars gather at South West Snooker Academy in these days to run for PTC Event 2 title. Ronnie O'Sullivan had a pretty good opening in PTC2. Ronnie won 4-1 over Nick Jennings. Stephen Hendry was a 4-0 winner against Ashley Wright in the first round but he lost to Ronnie in round 2 by 1-4. Ronnie kept a serious and focused attitude through out the matches. He met Matthew Stevens in Round 3 and this was a tough match. Stevens forced a decider before Ronnie made classy 100 to end the match, 4-3. He now faces Liam Highfield in Last 16. 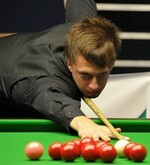 Judd Trump is also through to Last 16, beating Mark Allen in round 2 and Mark Davis in last 32 on his way. Trump looked like he has learnt a lesson from the previous defeat and showed better performance. Trump will play Neil Robertson in last 16. John Higgins lost to the Captain Ali Carter in Last 32 by 4-1 though Higgins beaten his fellow Stephen Maguire in the previous round. This big victory for Carter brings him a clash in Last 16 with Fegral O'Brien, who won his match over Tony Drago 4-3 from 0-3 down. Chinese players Ding Junhui and Xiao Guodong hold hands to enter Last 16. Ding faces Graeme Dott while Xiao plays Jamie Burnett. Both winner and runner-up of Australian Goldfields Open were on their way home. Stuart Bingham got beaten by Sam Baird when Mark Williams is eliminated by Ken Doherty. However, Doherty stopped at round 3. Defending PTC2 Winner Mark Selby lost to Adam Duffy by 0-4 after Selby whitewashed Shaun Murphy in the previous round.